Created to be stackable and space-saving, the LG DLE2701V electric dryer surprisingly has a huge 7.4 cu. ft. capacity. The LED Control Panel allows you to choose the necessary settings easily and its 7.4 Cu. ft. capacity is suitable for drying bigger loads. The Sensor Dry system, as it monitors the moisture level within the drum, keeps your laundry from getting over dried or under dried, so you only get perfectly dried garments every time. The LoDecibel Quiet operation keeps noise and vibration to a minimum, so that drying even a huge batch of clothes is not only convenient but also quiet. The ultra huge capacity of this dryer saves you drying time as you can accomodate more items within a given cycle. And if you have specific items that require more drying, such as towels or bed sheets or thick jackets, the SensorDry System determines which temperature and time is best to carry out the desired results. The NeverRust Stainless Steel Drum is built to result in more efficient drying, so you can reduce drying time and minimize energy consumption. Choose from a range of drying programs to suit different drying requirements, such as Heavy Duty, Manual Dry, Speed Dry, and Freshen Up. The convenience features of this dryer include a Reversible Door as well as 4 Adjustable Legs that help maintain its stability. This electric dryer is available only in Graphite Steel exterior styling. The LED Intelligent Electronic Controls eliminate any form of guesswork, allowing you to opt for the right settings for each cycle. Materials and finishes for this dryer include a porcelain top plate and chrome door rim with a silver edge. Rely on moisture sensors, through the Sensor Dry System, which work to adjust the right temperature and time according to the level of moisture contained in the drum. Choose from 12 different drying programs and dry your heaviest loads and your most delicate items just perfectly. Maintain a quiet drying operation everytime as the LoDecibel quiet operation feature keeps noise and vibration at bay. Load and unload all your clothes in and out of this dryer easily through its wide door opening. This allows you to easily take advantage of its 7.4 cu. ft. capacity. Since this dryer has a custom program feature, you can choose your preferred drying settings without trouble. One disadvantage to this 7.4 cu. ft dryer is that it does not include an extra large lint filter. 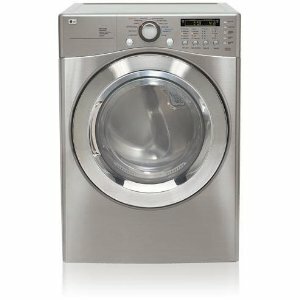 Electric dryers are generally less energy efficient than gas dryers. Unlike other appliances, this dryer has not earned an Energy Star rating. This dryer is not available in any other color, except in Graphite Steel.